This spring, put aside your dreary spring cleaning chores and join the intrepid gang as they shake the cobwebs off some truly cheesy movies on board the Satellite of Love! On March 25th, 2014, Shout! 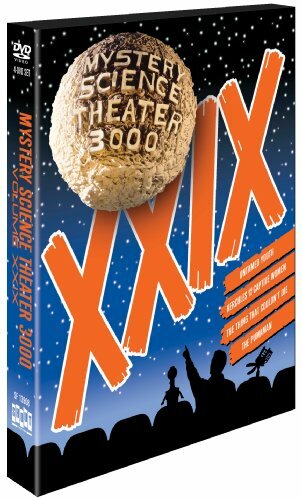 Factory will release Mystery Science Theater 3000: XXIX on DVD, featuring four previously unreleased episodes Untamed Youth, Hercules and the Captive Women, The Thing That Couldn't Die and The Pumaman. This 4-DVD set is also brimming with bonus features, including new interviews with Mamie Van Doren and Walter G. Alton; new featurettes The Movie That Couldn't Die and MST3K Artist in Residence: Steve Vance; new introductions by Joel Hodgson, About Joel Hodgson's Riffing Myself, four exclusive Mini-Posters by artist Steve Vance and more! Ahead of its time in many ways, the beloved comedy series Mystery Science Theater 3000 used social media before there was social media. Consider: a creative team of actors and writers put on a puppet show and shared with us not just cheesy old movies, but how they felt about them. They sent their show into the ether, hoping to find kindred spirits to join in the fun and pain. The comments were delivered verbally in snarky one-liners called riffs, the spiritual father of funny tweets. The initial popularity of the show mushroomed as fans made tapes and traded them...viral videos before they turned digital. Is it any wonder, then, that the first MST fans were drawn to the burgeoning internet, using it to find each other and share the love? All of the above notwithstanding, this new DVD collection is the only way to own these four never-before-released episodes with fun extras. Relationship status? It's not complicated: fans forever. #MovieSign! Mystery Science Theater 3000: XXIX brings us Untamed Youth, a rock n' roll exploitation flick about two beautiful and talented sisters on their way to Tinseltown who are arrested on trumped-up charges by a corrupt judge; the 1961 sci-fi fantasy adventure Hercules and the Captive Women, where, in a mishmash of myths, the celebrated Greek hero must battle an army of super warriors who are under the mysterious power of Atlantis' treacherous queen; The Thing That Couldn't Die, the tale of young Jessica, who is drawn to a crate buried on her aunt's ranch, only to discover the living head of a 16th-century devil worshipper; and The Pumaman, a 1980 sci-fi miracle in which a young paleontologist discovers that he is actually a flying man-god descended from aliens, destined to protect a really important mask before it falls into the hands of Donald Pleasence. * New Interview with The Pumaman Star Walter G. Alton, Jr.